This is my first time ever working in Mozambique and I was on a jolly journey back home to South Africa. I was crossing the border from Kruger National Park when I noticed a hippo on the bridge. There were people walking around in the nearby vicinity so I automatically assumed this hippo was used to humans. I was quite fascinated by this so I took out my phone to start filming. Suddenly the hippo turned and just started charging… I braced myself as I realized he wasn’t going to stop. 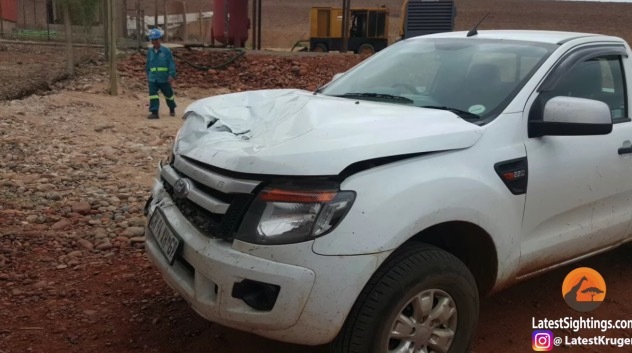 He hit the bakkie head on and then tried biting it. I guess after that he decided he had won because he just turned around and left. This was terrifying for me because I realized I had nowhere to go and no time to do it in. Beside me was a 50m drop so had he hit me on the side I have no doubt the car would have rolled down the embankment. Even though there was damage done to the bonnet of my vehicle and the door couldn’t open, I’m grateful there were no serious injuries at the end of day.